Amazon launched a service called Login and Pay with Amazon today at Money 2020 that lets partner sites enable a payments button that will compete with PayPal and credit cards for customer checkout. This is a direct blow at one of the bigger third-party payment options that consumers have at checkout and an effort by Amazon to capture a huge chunk of the web’s payment business at large. This new service combines Amazon’s long-standing payments services with its relatively new login services to form a new one-stop-shop integration for web payments. Amazon has been offering payment services for some time, which direct users to Amazon to authorize one-time or recurring payments. Kickstarter is a good example of this, as users log in to Amazon and are charged when rewards ship. Earlier this year, Amazon launched ‘Login with Amazon‘, a developer feature which allowed sites, games and other apps to offer login services using customers’ Amazon IDs. The seamless nature of the button, along with the security of the Amazon payments system and a simple oAuth implementation should make this attractive for developers and consumers. One of the initial partners for the Pay with Amazon rollout is Gogo, which is already using the retailer’s payments system for its in-flight Wi-Fi services. It will integrate the button later this year. Amazon says that the payments system is covered by its ‘A-to-z Guarantee’ that offers buyers the same protection as they get on Amazon.com. This offering takes that one step further by enabling a login process right on the partner site, letting people use their Amazon credentials to authorize a payment. This leverages the trust that people have in the Amazon name to expand Amazon’s third-party payments business. The power of trust is a big one when it comes to payments, and companies like PayPal have been leveraging this to sublimate credit cards for some time. Square has also been making inroads into this with its ‘Pay with Square’ digital wallets and payment code support. Before PayPal snapped it up, Square was said to be interested in acquiring BrainTree, which may have aided it in rolling out its own cross-site payments solution. Currently, Square seems to be exploring another branch of the payments tree with a marketplace that allows sellers to use pre-built storefronts and Square’s payment framework to peddle their wares. When we inquired about Square’s entry into this kind of API-based payments service, it said that Intuit is currently using something like it for its integration announced last month. A Square spokesperson would only tell us that they’ll have ‘more to share in November’ when grilled further. Amazon is second only to Apple in businesses that have collected massive numbers of customer credit accounts. Apple has over 575 million accounts on file at this point and Amazon has never published numbers of credit cards, but Taylor does quote 215 million “active accounts.” Apple says that it has the “most it’s aware of.” An external button will allow it to leverage those accounts in a big way. Other companies have made attempts to convert login information into a payments path, including Google with Wallet and Facebook, with its own currency and then with physical gifts. There are some more technical details about the program that are available now. You can receive seamless mobile payments across the web, Kindle, iOS and Android. The transaction fees are simple, at 2.9 percent + $0.30 per transaction or less, based on volume. 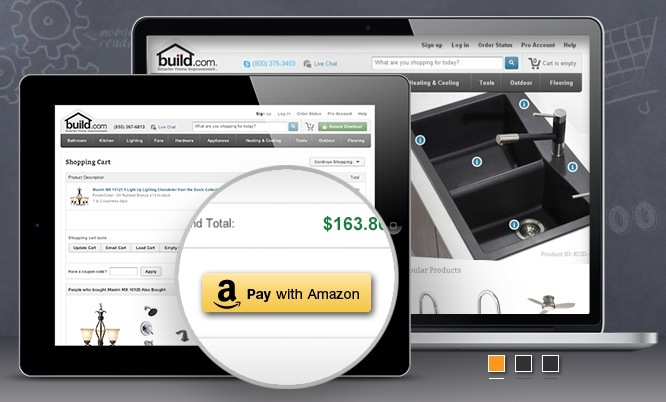 Developers interested in integrating Login and Pay with Amazon can check out the APIs here.